Every morning before school, Corpus Christi eighth grader Isabelle Koch heads to the cafeteria to walk with her classmates. She enjoys spending time with her friends, but it’s the bond she’s developed with a much younger student that caught the attention of fifth grade teacher Cheryll Bealmear. “She is drawn to walk with a student who is challenged with a disability,” Bealmear explained. It’s not just walking. 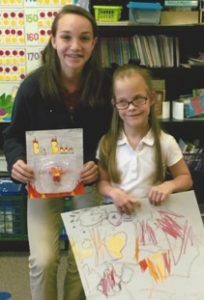 Bealmear, who supervises the walking program one day a week, says Isabelle also connects with her first grade walking partner, Claire Baumgartner, through conversation. “She just makes sure that student feels special. It really starts that student’s day off with a positive note,” said Bealmear. “I first started walking with Claire last year when a teacher mentioned that Claire needed someone to walk with her up the stairs. Shortly after we began, she managed to walk up by herself. After the teacher saw Claire and I got along so well, she assigned us as kindergarten and seventh grade buddies. Now I just walk with her because she is an amazing girl to be around,” Isabelle said. That friendship made enough of an impression on Bealmear that she mentioned it to Isabelle’s father, John. 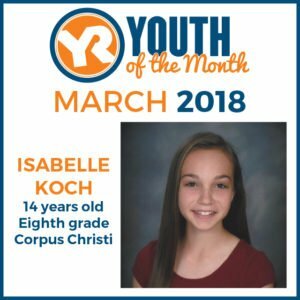 He and his wife, Deborah, nominated Isabelle for Youth of the Month honors. “It’s hard to put into words. Obviously it makes us feel proud that she is that way when we’re not around,” said John Koch. Deborah Koch says Isabelle has always been a giver. Her daughter donated her long hair when she was only about five years old. Isabelle volunteered with Riding Hope, a local hippotherapy and adaptive horse riding program for children with special needs, as a kindergartner. She continues to give back in various ways. As an eighth grader, Isabelle is already a member of Mater Dei High School’s varsity Winter Guard, marching band and Dance Cats. She’s also part of Junior Band, on the student council at Corpus Christi and is a server and choir member at church. She was named a Serra Club award winner earlier in the school year and maintains an “A” average. Isabelle has also enjoyed participating in Youth Resources’ TEENPOWER and Vanderburgh County Teen Court programs. “The Youth Resources programs have introduced me to many new people who are very nice and helpful. At the TEENPOWER camp, I met a lot of wonderful people who I am still in touch with. I also participated in Teen Court which taught me a lot about how the court system works and gave me an opportunity to serve in my community. The YR programs have helped me develop my socializing and networking skills,” Isabelle explained. “She listens, encourages, and shows others that we all have something we can contribute and not to give up. 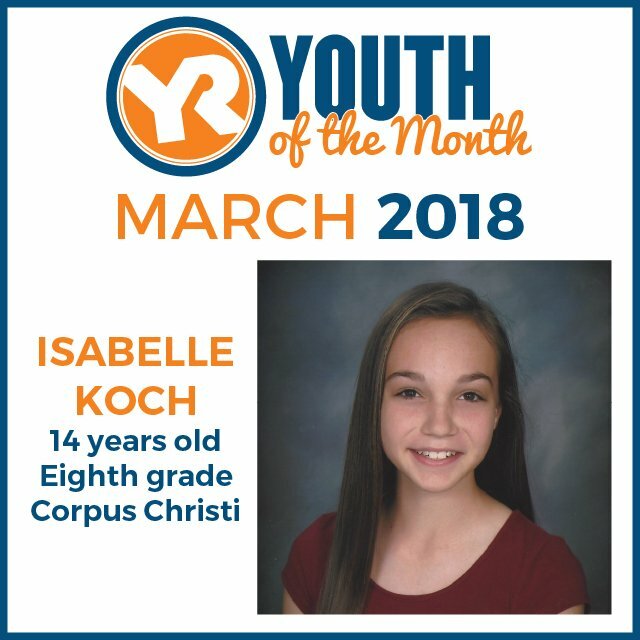 Isabelle shows that it is never too early to set a good example for others, get involved with your community and practice giving back,” said Isabelle’s mom, Deborah. As for her walking buddy, Isabelle plans to stay in touch with Claire even as she moves on to high school. “She is super sweet, funny and independent. Claire is one of the strongest and nicest people I know, and she is super fun to hang out with,” Isabelle said. Youth Resources is now accepting nominations for its April Youth of the Month. Nominate a student (ages 5-18) who is making a difference by clicking here. Erin Meyer is the Development Director at Youth Resources.